A sample ad for the Screen-A-Show Cassette Projector that appeared in comic books in the mid-70s. In the 1960s & ’70s, Kenner produced a whole host of film-based toy lines that used media in a variety of different formats. These included the Give-a-Show Projector, Movie Viewer, Easy-Show Movie Projector, Cassette Movie Projector, Super Show Projector, and Change-a-Channel TV Set. 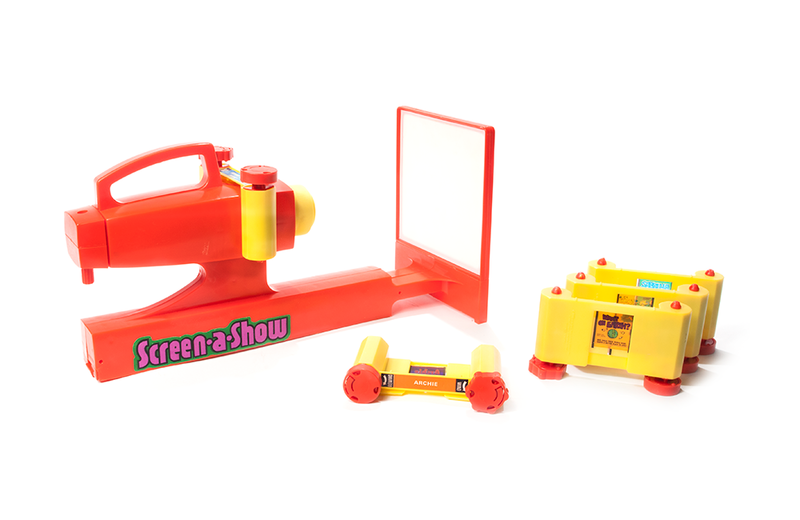 The Screen-A-Show Cassette Projector, released in 1972, was part of this selection of toys for cinephiles. It ran on four D-batteries and included a built-in screen that was translucent, making it possible to see the show from both sides. Other selling points were the use of film cassettes that could be easily snapped in place by young children, and a removable screen enabling shows to be projected on walls or ceilings. With the power on and a cassette in place, viewing a show was accomplished by manually advancing the slides through the turn of a knob. Each cassette contained roughly 20-25 full-colour slides. 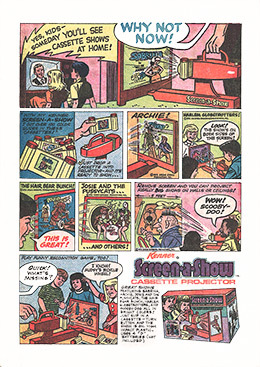 Kenner marketed a variety of shows for the projector, including Archie, The Hair Bear Bunch, Josie & the Pussycats, and the Harlem Globetrotters. With recorded phrases like “Hey, Hey, Hey”, “Ridiculous”, “Absurd” and “Nicely Done”, Milton the electronic game has attitude! In addition to providing generations of children with countless hours of open-ended play, 2014 Toy Hall of Fame inductee, Bubbles, played an important role in the formation of iconic toy company, Kenner Products.